Honest, Reliable and Professional. With over 58 years experience in the roofing industry, we are North Wales’ leading specialist roofing contractor. All our specifications are guaranteed and if our reputation and our history are not enough then we can also issue customers with insurance backed warranties for complete peace of mind. Now in its 3rd generation since our founder Mr Brookwell first came to Anglesey, Anglesey Roofing is looking forward to solving all roofing problems across our beautiful island and beyond for many years to come. 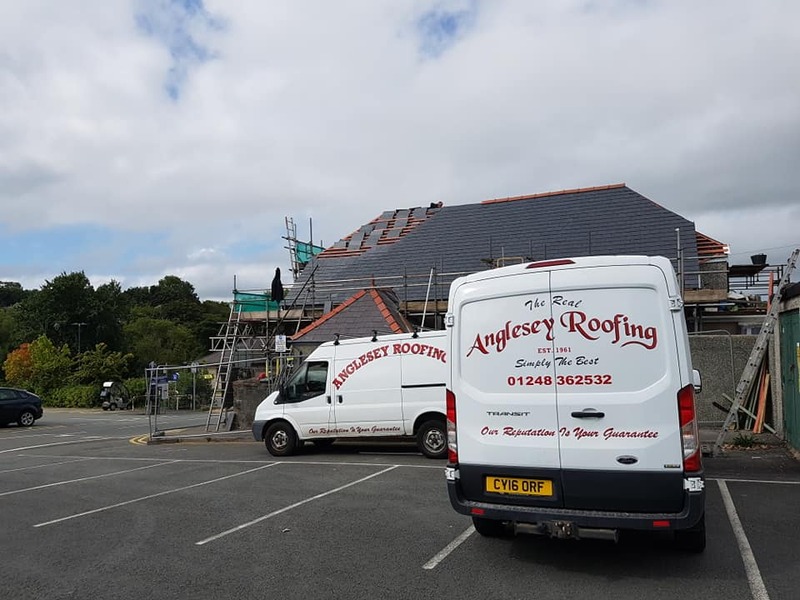 The story of Anglesey Roofing Company started way back in 1960 by a Mr Frederick Joseph Brookwell who arrived on Anglesey from his home town of Wigan, Greater Manchester to carry out roof repairs to the old ‘Lairds’ factory premises at Beaumaris. On his return to Manchester he vowed that one day he would return to the small island that he had fallen in love with, he did just that less than 12 months later. Returning to his adopted ‘home’ to spend the rest of his days in sunny Anglesey. So in 1961, he founded his own roofing company that still trades to this day under the name Anglesey Roofing Company Ltd. Due to the growth and success of the company, in 1981 we relocated to our current address at 390 High Street, Bangor, North Wales. The move set us up for the business opportunities that would beckon us down the A55 and beyond. We never once thought about changing our name even though we changed our business address. Lots of Mr Brookwell’s original customers have re-applied to have their properties re-roofed again, some 25 years after the original installation took place. Our oldest roof to date was re-roofed in October 2008, 38 years after we first waterproofed it for Mr TG Pritchard of Bronallt, Llangefni Road, Tynygongl, Anglesey, beating our previous long standing record of 32 years. Anglesey Roofing Company work to a very high professional standard. We carry out all kinds of domestic and industrial work, dealing with both large and small commercial contracts. All our work is fully guaranteed, we are contractors for all local authorities and we are approved by all major roofing felt distributors. Whatever the size of the job our fully qualified staff approach each task professionally and with attention to detail. No job is too small and we have yet to find one that is too large. We have been in the Roofing business since 1961 and have considerable experience with all aspects of modernisation and roofing improvement. Our highly qualified staff carry out quality work, leaving a clean and safe environment. We can remove and re-cycle all debris from site. From a small bay windows to a 2000m2 roof we approach every contract with the same professional attitude because we know that we are only as good as our last job. Our reputation is on the line. All our specifications are guaranteed and if our reputation and our history are not enough then we can also issue customers with insurance backed warranties for complete peace of mind. Trading for over 58 years we have a wealth of experiance that we bring to every job, our customer tesimonials say it all. The National Federation of Roofing Contractors Limited (NFRC) is the UK’s largest roofing trade association. When Anglesey Roofing Company said my roof would last 20 years, they meant it. Mark has just re-roofed it again 27 years after Mr Brookwell senior first carried out the work.